There will always be those who love old movies. I meet teenagers who are astonishingly well-informed about the classics. But you are right that many moviegoers and video viewers say they do not "like" black and white films. In my opinion, they are cutting themselves off from much of the mystery and beauty of the movies. Black and white is an artistic choice, a medium that has strengths and traditions, especially in its use of light and shadow. Moviegoers of course have the right to dislike b&w, but it is not something they should be proud of. It reveals them, frankly, as cinematically illiterate. I have been described as a snob on this issue. But snobs exclude; they do not include. To exclude b&w from your choices is an admission that you have a closed mind, a limited imagination, or are lacking in taste. Rest in peace, Roger, without whom none of us would be here in quite the same way we are today. 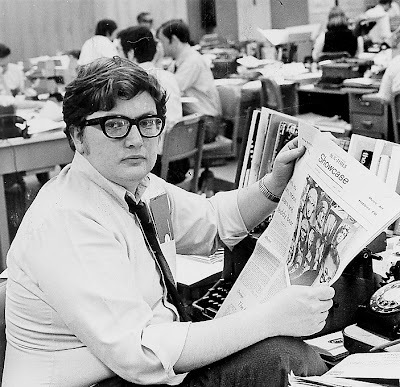 More on Mr. Ebert at the newspaper he wrote for, the Chicago Sun-Times. Sad day, I visited his page weekly. Damn, a huge loss. Thanks for the news, i found out through your blog.